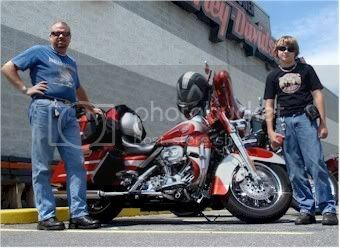 My 13 Yo son who is planning on a career as Motorcycle Mechanic has to do a research paper on an Automotive subject and convinced the teacher to allow him to pick the V-Rod (His planned bike of choice when he gets his license). He's not allowed to use Wikipedia as a source but can use any other book or website. He needs design, origin, technical and social info on the bike. We know about the discovery channel special documentary and the brief mention in the Special Edition for 110" CVO Owners Only Coffee table book ... Any other recommendations or sites you can lead us to would be greatly appreciated. Me, Screamin' Nemo and The Kid. http://www.encyclopedia.com/doc/1G1-132141555.html Quite a few different articles here. Thanks for the links guys. We'll look them over during the weekend. Thought about the customer service angle and tried a short cut to my local dealer who's a friend. They had all the rollout material from the release back in 2002 and that paid off. I had only though of brochures, but there was a lot of other stuff. Good Call Neal!